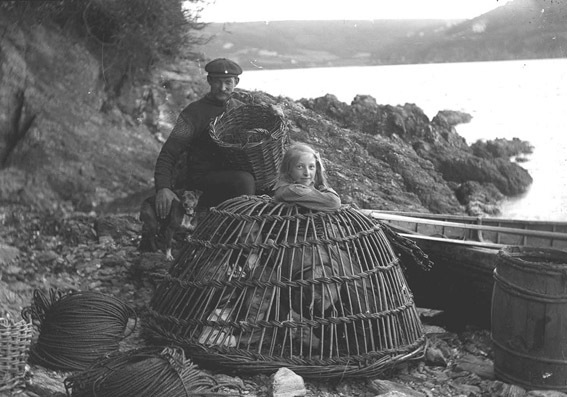 Above Edwin (Ned) Stone, expert basket and crab pot maker, watches his children play in a storepot at Small’s Cove, South Devon. c. 1900. Store pots were used for holding caught crabs on land. Busy fishermen’s wives often put their babies inside pots, using them as playpens. Image: Copyright of Kingsbridge Cookworthy Museum. 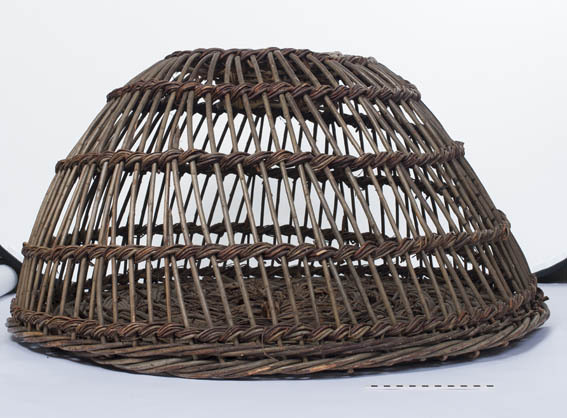 Around the southwest coast are many small willow beds, now often overgrown, that in the past provided materials for making crab and lobster pots. Names such as Metheligh Bottoms (Porthleven, no longer a willow bed) or Duke’s Meadow (East Allington, still maintained) are indicative of suitably damp sites and a clue to the names of the families involved in the fishing. 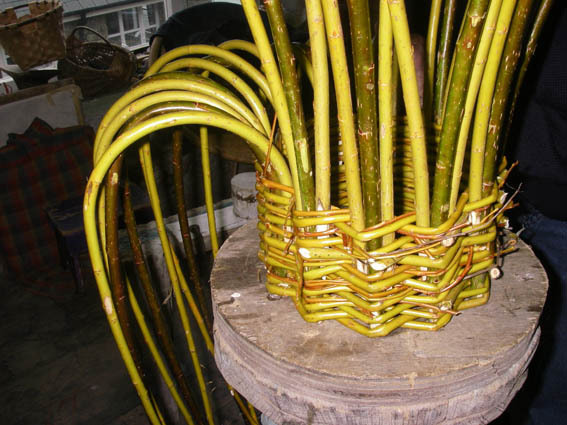 Willow rods, known as withies, mainly the viminalis variety, were cut from the time that the leaves fell in autumn until the sap rose again in the spring. In Cornwall tamarisk, elm and hazel were also used. 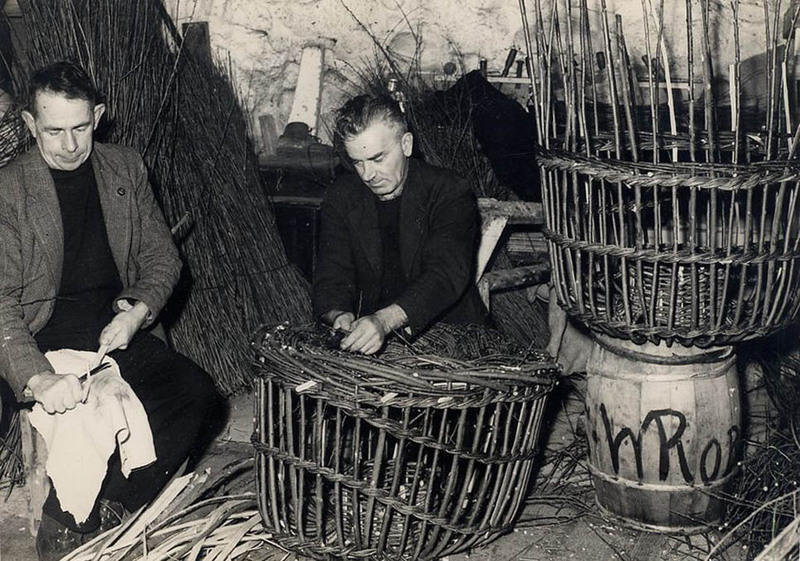 Crab pot making was winter work for fishermen, working at home or in the net lofts. standards around a former before using them. The difference in undersea and coastal conditions also dictated how heavy-duty the local crab pot had to be. Cornish pots have a substantial base and a guard of heavy-gauge withies called the ‘chim’, which takes the majority of the wear. ‘mould’. ‘Pitchers’, extra rods, 3/8” diameter are inserted next to these in the weave. Above The standards and pitchers are shaped into a curve and fixed to strops on the mould. 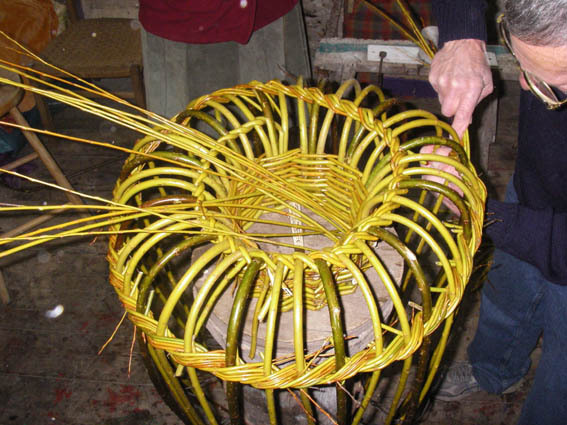 George Chambers starting a pot using ‘golden’ willows. 2012. Image: Lin Lovekin. The ‘mould’ was constructed from a piece of old telegraph pole or ship’s mast 3’ long. On top was fixeda hardwood disc. 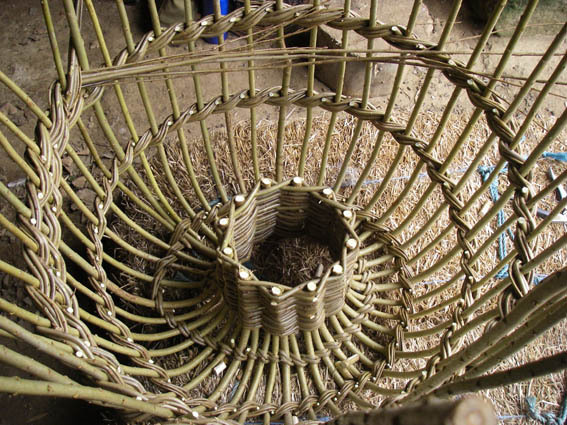 Holes were drilled in circles of therequired diameter for: lobster pot 8”, crab pot 9”, storepot 10”. Pot by Richard Ede. Image: Lin Lovekin. Image: Penlee House Gallery and Museum, Penzance. 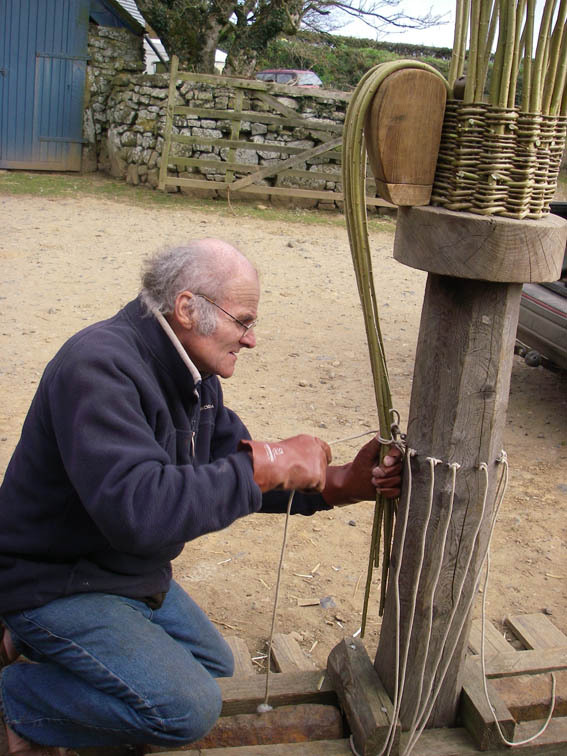 Making crab pots at Porthgwarra. c.1950’s. Harry Penhaul 1914 – 1957. 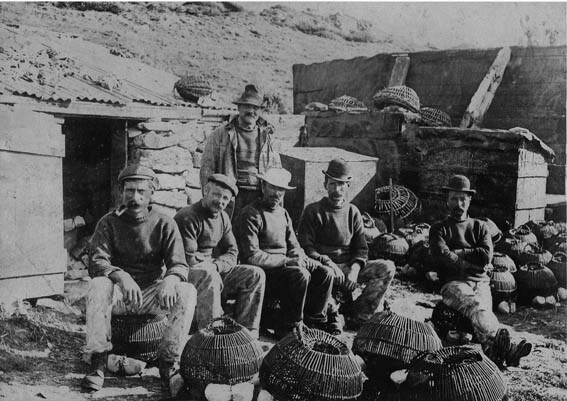 This 100 year old photograph shows the Isle of Wight prawn pots used in those days being prepared for the start of the prawn season mid August. From left: Miller Lander, Harry Wellman, Andrew Squibb (standing), George Hooper, Frank Lander (whose daughter Rose made the prawn pot in the exhibition downstairs) and Mont Hooper. 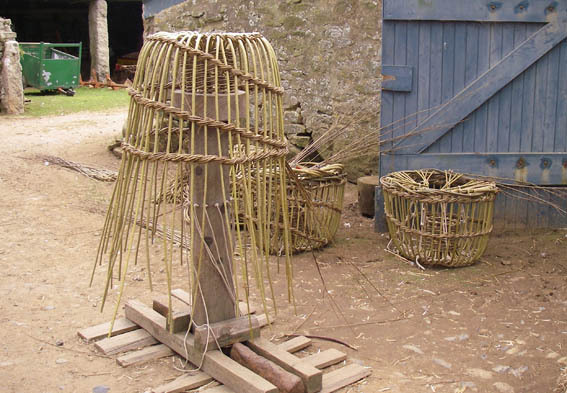 Very finely made prawn pots much smaller and more delicate than lobster/crab pots were woven on the Isle of Wight. This design of pot was also made on the Dorset coast between Swanage and Lulworth Cove where generations of the Lander family have fished commercially.